Heading to the New England Regionals! 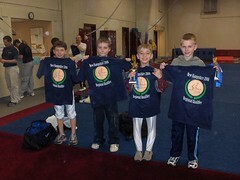 Yesterday was the NH State Championships for boys level 5-10 at Gymnastics At Brentwood Commons. Trevor placed 3rd in the All Around and will be heading to the New England Regionals in a few weeks. All Around -- 3rd place! Gymnastics Village had an outstanding result at the team level -- 1st place for Levels 5, 6 and 7!